This book gives an in-depth analysis of how schematic maps assist the user, when they fail, and the psychological theories that explain why. It asks whether traditional design techniques are suited to today’s complex networks, and explores what happens when the rules are broken. The result is an astonishing collection of maps for cities worldwide that challenge preconceptions about the nature of effective design. Whether you are a graphic designer, transport professional, or just a frustrated commuter, maps will never seem quite the same again. The book isn’t going to be be available on Amazon, members get a rock bottom discount – at £37.50 all in. Applies to UK based members – other countries please contact enquiries@signdesignsociety.co.uk, so we can assess P&P. Offer at this price applies while we have stocks. This beautifully produced book must, of course, be fascinating to enthusiasts of the underground and/or of cartography – but it is also a great find for the general reader. 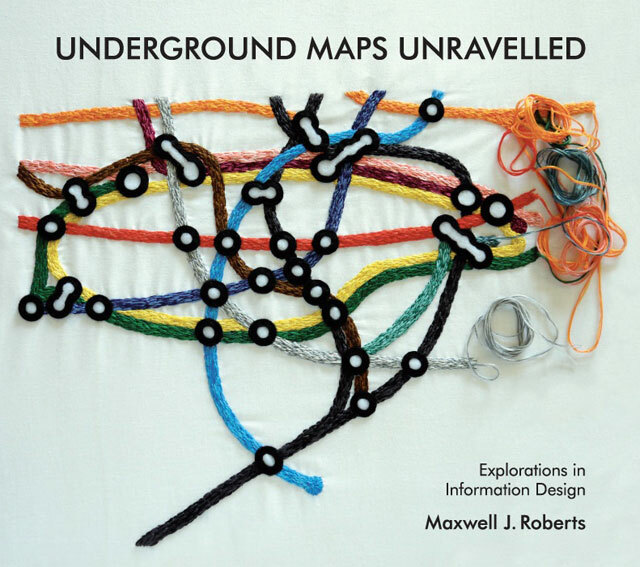 The book is very readable – Dr Roberts has an easy, elegant and witty style – and it is absolutely packed with interesting information and comment on the history, aesthetics and science of underground map-making, leaving you with plenty to think about: the psychology stuff is highly accessible. Strongly recommended. It is impossible to do justice to this fascinating volume in words alone. His creation, and the visuals in particular, have to be seen to be appreciated. It is clearly a labour of love, but it is a beautiful production. I can virtually guarantee hours of pleasure poring over the meticulously created ‘what if’ designs. The book may seem to be highly technical or too deeply specialised. It is not; it is readable, informative, and it sets in good context many of the other books on diagrammatic maps. If your library already contains many such books, this one is a vital addition that you simply must not miss. If you have no such books, but think that the subject may be of interest, this is the book to have. The author has also shared with the reader not only the fruits of his study from a highly objective viewpoint, but also his considerable skills as a creator of maps. Highly recommended. The book can be seen as a wake-up call to graphic and information designers who are not precisely following Beck’s rules to communicate complex information and thus failing to achieve clarity, simplicity and legibility. It sheds light on the conceptual design process and the development of complex design projects. Roberts’ s analysis enhances understanding on how diagrammatic maps can assist us, when and why they fail on doing so. He unpacks theories and explains ways to avoid cluttered communication and the development of unintelligible diagrammatic maps. The book supplements explanations with the analysis of visual examples and case studies, which demonstrate possible problems that may occur when traditional design rules are not being followed properly. Maxwell Roberts received a bachelor’s degree (1988) and a doctorate (1992) in psychology from the University of Nottingham, teaching at the Universities of Newcastle-upon-Tyne and St. Andrews before accepting a lectureship at the University of Essex in 1993. He has researched extensively into intelligence, problem solving, and reasoning, resulting in many scholarly publications. In 1999, with an evening to spare, he attempted to create a fantasy Underground map. Thus commenced an ongoing research programme to understand transport schematics, their effective design, and how to evaluate them using objective methodology. Along the way, numerous experimental, rule- breaking maps have charmed or infuriated the general public, and his work has been exhibited internationally. Some interim findings were presented to the Sign Design Society in 2009, and he became a member in 2010. He has a passionate commitment to evidence-based design and has planned and implemented usability studies on behalf of FWT and Transport for London.